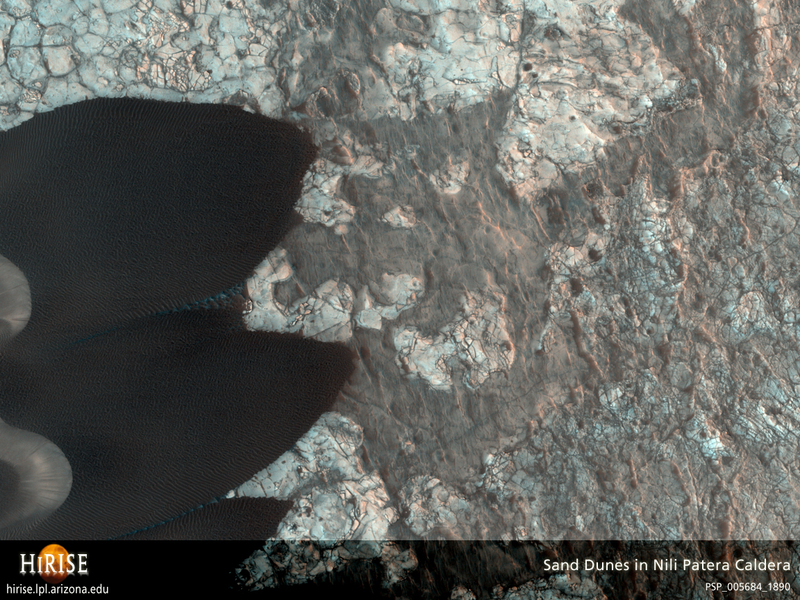 A set of dark sand dunes within the northeastern edge of a dune field in Nili Patera, a volcanic caldera in the Syrtis Major region of Mars is the focus of this HiRISE observation. The lighter surface beneath the dunes is an ancient lava flow. The cracks in the flow probably formed when the lava cooled. Many of the cracks are dark and probably contain sand; the dark color of the dunes suggests that the sand is basaltic in composition and therefore originally derived from volcanic rock. However, whether the sand formed from Nili Patera is not known, as it is possible the dunes have blown in from a more distal location. With two horns on one end and a rounded edge on the other, the dunes have a distinctive shape. The side of the dunes with the horns has a steeper slope — called the slip face — and the rounded side exhibits a more shallow slope. 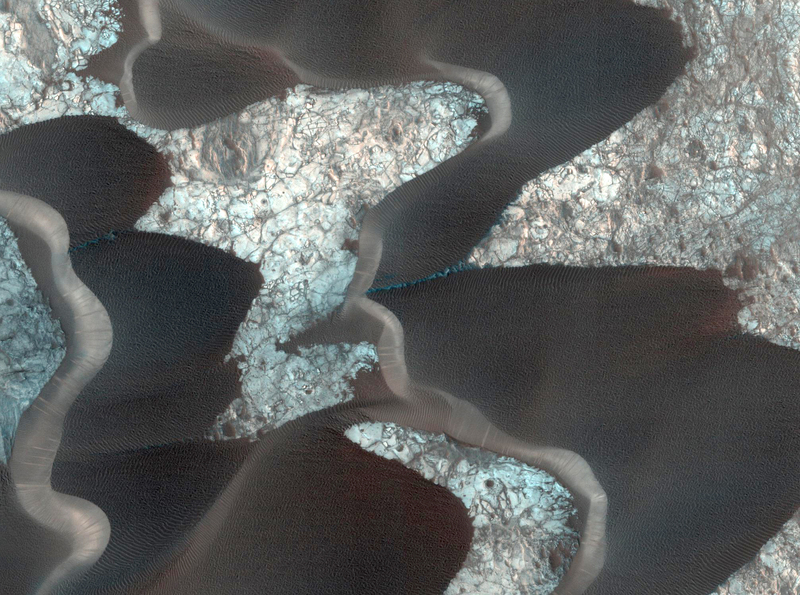 These types of dunes are called “barchans” and, in analogy with similar dunes on Earth, form in areas with limited sand supply. The horns of the barchans point in the downwind direction, indicating that the predominant surface winds in this region blew from the east-northeast (slightly upper right in the image). Zooming into the image, one can see landslides on many dune slip faces, indicating fairy recent slope failure. Very small ripples are visible on the dunes” surfaces, showing that the winds in this region have not only blown the barchans across the lava plain, but also modified the dunes themselves. Another HiRISE image, PSP_004339_1890, shows more barchan dunes in Nili Patera, south of this area.